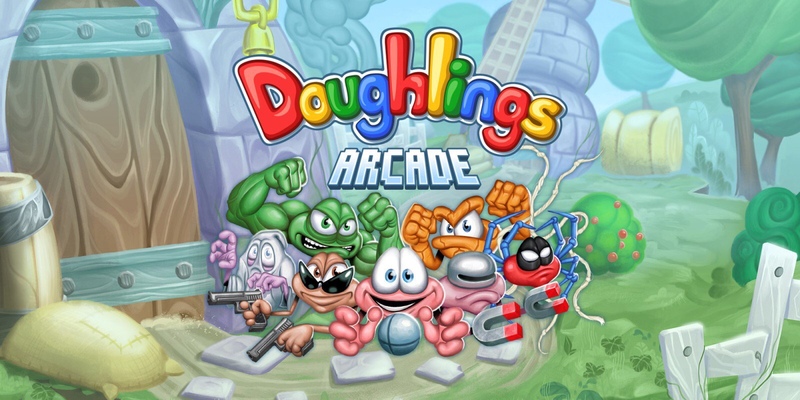 It’s taken its time, but my long overdue review for Doughlings: Arcade is finally here! In the last year, a number of brick breaker puzzle games have all graced the Nintendo Switch eShop with their presence and joining their ranks recently, is none other than Hero Concept’s Doughlings: Arcade. As a developer that dates back to 2017, Doughlings marks their first game to grace multiple platforms and is a game in which puts you in the shoes of Dr. Morpheus. The good doctor is on a mission to cure and save his people from a poisonous gas, which has come to pass after a meteor descended from the heavens. In order for Dr. Morpheus to cure his people, he must battle against the poisonous gas to get it off them. Across Doughlings: Arcade, there are a total of 75 levels for you to play through and just like any other break breaker game, you have to continuously hit the ball directly at the targets until all are gone to clear the level. Doughlings: Arcade also features “boss battles” aka harder levels. All players are notified if a level is hard thanks to a snot green color icon that will appear before the current level starts. On top of Dr. Morpheus, there are 6 other playable characters (Smash, Gunner, Robo, Webster, Bedrock and Spook) and each of these characters have their own special power-ups for players to take advantage of. You can become one of the 6 when you collect their DNA strand in the level. For instance, when you use Smash, it allows you to have an easier platform for hitting the balls back and forth, it also has the ability ThunderClap which is used when Doughlings fall the stage. With Gunner, you are able to use a gun to shoot bullets at the Doughlings, Robo allows you to use a Magnetic effect which brings the ball back to the platform without the constant (back and forth mechanic), Webster allows you to shoot out two balls at the same time. Spook uses its intimidating looks to defeat the Doughlings, and last but not least Bedrock, Bedrock bring a bigger ball which makes for massive destruction. Aside from the character power-ups, there are two other power-ups that are in the game. The star power-up, which can be used to create a color ball. The color ball can be used to hit multiple Doughlings. Aside from the character power-ups, there are two other power-ups that are in the game. The star power-up, which can be used to create a color ball. The color ball can be used to hit multiple Doughlings. Although, the main levels of Doughlings: Arcade are great themselves, another great feature the game has, is a level editor, which allows players creative and make their own levels that can be played by other players across the world. I really enjoyed playing around with this feature, especially since it is both highly enjoyable and you can choose where you want the Doughlings to be placed. The power-ups, and layout of the stage. The music and graphics in this game is incredibly good. The graphics gives off a classic 90’s look with HD visuals, while the layout is very simple and easy to use and reminds me of a mobile puzzle game. The music has a very energetic and upbeat vibe and graphics are very crisp and vibrant. Along with the controls very easy and simple to use. Overall, Doughlings: Arcade is probably one of the best arkanoid games I’ve have played so far. It has a lot of good quality content and I can’t help but wish the developer provided even more content, as I really enjoyed it. But the short of it is Doughlings is a lot of fun, and if you want a puzzle game that has the classic puzzle mechanics but with more variety and features, than Doughlings: Arcade is the puzzle game for you.